When my dad died my house became the repository of some of his personal stuff. My siblings and I had divided up who wanted what, clothing was distributed to Goodwill, and furniture and household items no one wanted were sold to a strange little man willing to haul it all away after we sold the house. What remained were all the photo albums, record albums, music my dad had written along with all his songbooks, and his personal papers. As the only one in the family interested in genealogy, I took all of these so that I could later sort through them. Since I was handling his estate, I needed all his financial papers anyway. Five years later, the albums remain stashed under a guest bed, his papers bulge out of my filing cabinets and I have painfully tried to remove the photographs from those nasty, self sticking, acid producing vinyl photo albums we all thought were so great when they came out in the 70's. But one box of items has poked it's ghostly fingers into my mind all these years, urging me to set the contents free. The box contains my dad's personal items from his service during World War II. Dog tags, military papers and photographs create an outline to a story just waiting for words. My dad, unlike a lot of men from his generation, did not mind talking about his military service. Unfortunately when I was younger I was uninterested in history, much less something as testosterone laden as war talk. After I began to do genealogical research and recognized the importance historical events played in shaping my ancestor's lives, I did sit down with dad and create a time line of his service years. I regret now that I did not capture some of his recollections such as the "Yankee ingenuity" which took place, enabling the soldiers to process photographs without the benefit of a darkroom and, more importantly, their improvisation to keep their beer cold. Yes, the old retrospectoscope always makes things so much clearer. I can't write what I don't remember. But I can take his memorabilia and let it speak for itself. If a picture is worth a thousand words, then there is quite a story waiting to be told. Jim's internist called here the week before last to talk to him about his latest blood test. I always am amazed by people who call here during the day expecting to find him. Hello! Work day! At that particular moment he was on his way down to Cape Girardeau, which happens once if not twice each week. The doctor decided to break every Hippa law and talk to me about the results. Since I do all the shopping and cooking, this makes sense to me. He informed me that Jim's cholesterol was at 137, and he really wants it to be below 130. (When I told Jim's mom about this number, she said she would be doing cartwheels - assuming that was still possible at 78 - if her level was 137. She is up in the 240 range, despite taking medication.) Anyway, I got the old fish and chicken lecture. He can eat fish or chicken, no beef. No eggs, no dairy (except skim milk) yadda, yadda. We are now in our third week of no beef. I can't say I really miss it, but I am quickly tiring of chicken. As I am not much of a fish lover, this will be a challenge for me. I talked with Jim's older sister over the weekend. She had a cardiac cath done a couple years ago, and she got the fish or chicken lecture from her cardiologist, who happens to work at the same hospital as her. By the time he was done, he had her in tears. One of the nurses came in, took one look at her and said "The food Nazi was in here, wasn't he? I'll send the dietitian in to talk to you, and she'll tell you what you can really eat." It ends up that a lean hamburger has less fat than some chicken. So I obviously have some research to do. I was a little surprised that the American Heart Association website offers very little in the way of menu preparation. Oh, wait...they have a book they want you to buy. I had a little more success with the Mayo Clinic website as they offer some heart healthy recipes. But until I get it all sorted out, what would you like for supper tonight? Fish or chicken? Jim had his cardiac cath done last Friday, suggested as a result of an abnormal stress test. The only reason he had the stress test done is because he and his partner at SWT applied for additional life insurance protection in the event one of them dies. Despite the economy, business has been really good and the company is growing. All good news, except for the stress test. Due to his age, the insurance company required Jim to take the stress test in addition to the usual and customary check-up. Because of the stress test outcome, his internist referred him to a cardiologist. Based on family history and some chest tightness, the cardiologist recommended the cardiac cath to see if there is any blockage in the arteries. We arrived at the outpatient center, conveniently located next to the hospital in case further surgery would be required, at 8:30. He was taken fairly quickly to a room to change and be prepped, and then I was allowed to sit with him until the doctor was ready. My sister met up with us so she could keep me company during the procedure. By 9:30 he was taken away, and we went to the cardiac cath family waiting room. If all went well, the doctor should come in to see us in about a half hour and let us know what, if anything, he found. If blockage was discovered, Jim would immediately be wheeled to the hospital so any surgical procedures could be performed. As 30 minutes became 45 I was beginning to worry. The doctor came in, and he is a poker face. I could not tell from his facial expression, or lack thereof, if he had found anything or not. He brusquely said, "The procedure went well. I didn't find anything. You can see him in about 30 minutes." I thanked him, and he turned and left. That was the last we saw of him. Some chairside manner...After 30 minutes we went in to sit with Jim, and he had to lay flat on his back for a total of 2 hours. At that point they would get him up to walk around and, if he wasn't dizzy, could eat the lunch they were providing for him and me. Funny story on the lunch - when they offered him the choices, one was a prime rib sandwich. He said, "This is a test, isn't it? I'm not allowed to eat beef anymore!" He ordered us turkey sandwiches. Jim said he was awake for the whole thing. Apparently people react to the anesthesia in different ways. Some people go totally out, some are awake but don't remember anything, and some are awake and remember everything. He actually watched the procedure on a monitor. Yikes! I would have passed out. I remember when I had an amniocentesis done while pregnant with Katie, and when I looked at the screen and saw the needle in my stomach I got very light headed. I could never work in the area of healthcare. At any rate, he did well and we enjoyed the lunch they brought, and we were home by 1:30. A good result all the way around, and he did fine over the weekend. Not to borrow trouble but what threw off the stress test? It is cold again in St. Louis, with the temperature currently at 23 degrees. What's up with that? The weather around here never seems to be "average", whatever that is. We are always "above average" or "below average" for this time of year, blather the forecasters (can anyone say oxymoron for that word?) 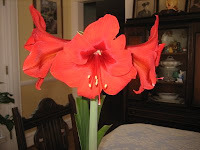 But my little amaryllis is blooming like crazy to assure me that spring can't be too far away. My husband gave me the bulb for a Christmas present, and it has been fun to watch it defy the cold temperatures and burst forth with blooming quadruplets; alas no octuplets here to stir the media pot. The flowers bring vibrance to an otherwise gray season, and a sense of anticipation for the new colorful carpet which will be unfurled outside as the days begin to warm. And that is something the media, with their persistent coverage of all that is negative, can't take away from us. Last year at the auction raising money for our juniors to have an all night, safe fun party following their graduation ceremony this spring, I offered up a custom graduation quilt as one of my donations. Placing a minimum starting bid of $500 on the quilt I knew would scare most people away. But a quilt made of t-shirts put together by one of the moms the previous year had sold for $1500. From past experience I knew how much it would cost to gather up all the specialty fabrics representing the interests of the graduate, not to mention any photos or embroidery that might be included on the quilt. I was will to donate the time and materials, but only if the class was really going to benefit financially from my endeavors. After all, I have a quilt to make for my own daughter as well. As it turned out, only one person bid on the quilt. I have been in contact with the winner, and she has given me insight into her daughter's interests and favorite things. I showed her examples of my quilts and she selected the block arrangement she liked the most. I want to make the quilt large enough to snuggle under, so I need 70 total squares for the base of the quilt. So far I have found and sewn 33 novelty prints. I am concerned that I will not be able to find an additional 37 that will relate to this girl's interests. It is so much harder to make a quilt like this for someone you don't know. I may end up alternating plain squares with the print ones. But the last thing I want is for the mom to feel that she is not getting her money's worth from my efforts. No pressure! I think I'll take what I have done so far and show it to the mom so I can get her input on how to proceed. At least with Katie's quilt she has selected a pattern she likes that will showcase some of her photos from France. That will be a piece of cake after this one! The St. Louis Genealogical Society had a presentation yesterday on linking historical events to your family history. The presenter, Pat Stamm, used Samuel Clemons in her illustration of how events in history probably shaped Clemons' life in terms of where he moved and what he wrote about. It was a very interesting discussion, and one I hope to put into use as I write my dad's story during WWII. I had gone to the meeting thinking about how to use timelines in writing family history, and how talking about historical events could add another dimension to it. But during the Q. & A. a woman mentioned how she was going to take what she learned and create a timeline of her father-in-law's life for an 80th birthday party. Which got me thinking about the senior all night graduation party I have been working on with the other parents. Wouldn't it be fun to create a timeline from 1990 to 2009 and have it on a board for the kids to look at? A lot has happened in the world and the country in the last 19 years. Being in charge of memorabilia, it would fit right into what I am working on. I already have created a list of the number one songs for each of those years (with the exception of 2009, of course), and we'll have photographs from years past on boards for the kids to look at. A timeline will be a nice addition to all that, I think. We'll see what pops up. Links and Tweets and Pings, Oh My! The St. Louis Publishers Association meeting last night covered two topics - search engine optimization (SEO) and social networking as part of an author/publisher's marketing plan. The two guys speaking on the topics were very knowledgeable and informative. All I could think is that this is a whole new language, sometimes as confusing as trying to figure out one of my daughter's text messages. I was somewhat pleased with myself in that I am involved in three of the social network platforms that were discussed: LinkedIn, Facebook and Twitter. I wouldn't touch MySpace with a ten foot pole because, as my daughter says, that is so yesterday. I was able to follow along with the social networking discussion fairly well. The search engine optimization spiel was a little more technical, not helped by the guy sitting behind me. You know the type - there is one in every crowd. His questions revolved around his specific situation, which was fine for the first two or three questions he threw out. You could tell that the presenters enjoyed having another geek squad person in the house, so unfortunately this only encouraged Magazine Man (he apparently sells magazines involving his wife's motivational speeches off their web site) to constantly shoot his hand up in the air. Apparently Magazine Man thought last night was a personal tutoring session for him alone. The program moderator really needed to nip this kind of behavior in the bud. At any rate, the most interesting thing I learned was that you can create widgets without know html (talk about geek speak! ), and place said widget not only on your website but within your social networking sites as well. That sounds like something to sing about - tweet, tweet! It is somewhat ironic that February is American Heart Month. We just learned today that my husband needs to have a cardiac catheterization performed later this month. Oddly enough he has not been having heart problems. He and his partner at the landscape architecture firm decided to take out life insurance policies in the event one of them should die. The remaining partner could then take the life insurance proceeds and buy the widow out of her share of the business. During the routine testing for the policy, the doctor requested that Jim take a stress test because of his age. As the results of that test were not encouraging, Jim was sent to a cardiologist. The cardiologist wants to do a cardiac cath to find out what is going on. Jim's older sister had the same test done a couple of years ago, but due to the small size of her arteries they were unable to insert a stent, which was indicated in her case. So far, she has not had any further issues with her heart. I am a little uncomfortable with the hospital that has been scheduled for the test, so I am doing a little more checking into it. That comes from 15 years of working for a medical malpractice insurance company. We only saw the bad things that happened. I believe in increasing your odds for a good outcome by selecting the best doctors and health care facilities. I have nearly two weeks to figure it out. Since receiving the quote to have my book designed outside and in by a professional, I have been mulling over which way to proceed. While I do understand that the pricing I received is not out of line, or so I'm told by authors who have already trekked the somewhat treacherous path of self publishing, I still can't wrap my mind around how many books I'll have to sell just to pay the design fees, let alone the printing costs. I headed back out last night to one of the local mega bookstores to do some undercover (or should I say cover?) research. I first picked up Dan Poynter's "Self Publishing Manual" as I had learned from borrowing a library copy that it was a book I'd want on my own shelf. From there I went to the table reserved for books of local interest. I thought I would be able to pick out which ones were self published by looking at the covers and flipping through the pages. Surprisingly, I found that I certainly couldn't judge a publisher by the cover. One of the books I found to be the least attractive was actually put out by a local publisher who has turned down my book. Well, I always say that things happen for a reason and now I am grateful that the future of my "baby" is not in their hands. After that I went to the non-fiction section and began to pull books that were of a how-to or workbook nature off the shelves. It was an enlightening experience. People definitely WILL judge a book by its cover, and I realize now that I do need to put the money into a professional design. No one will pick up my book to see what it offers if they can't get past an uninspired cover. Jim and I drove to Jefferson City today for discussion of a new Senate bill which deals with diverting additional waste from the landfills. The Senate hearing room was packed to the max, with every chair being occupied. I guess no one got the memo about energy conservation because it must have been 90 degrees in the room. That's actually pretty ironic since the Department of Natural Resources was represented in the room. The committee shook up the agenda a bit and allowed the reading of a bill which would bar telemarketers from calling cell phones, using computer generated recordings and sending unsolicited faxes. Apparently the sponsoring Senator's constituents were very annoyed during the last election (who wasn't?) by the number of computerized phone calls they received soliciting votes for him. He claimed he was unaware that these calls were being made. Yeah...and I've got a nice bridge to sell you, too. Anyway, supporters were invited to speak, and two women did so. One was from the Attorney General's office, and the other drug her oxygen tank up to the front speaking on behalf of AARP. That's what she said. No naysayers wanted to speak, so they went on to the next bill. Which was one that would bar telemarketers from calling cell phones, yadda, yadda, yadda. No, I did not type the same thing twice. Same bill, different Senator, same two supporters. And you wonder why nothing much gets done. Couldn't these two Senators agree long enough to come up with one bill? I didn't get a chance to see if they were from different parties. Next came the bill we had come to support. Missouri put a ban on yard waste going into landfills back in 1991. At the same time it was recommended that by 1998 the state divert 40% of the waste from the landfills. This was not a mandate, merely a suggested goal with incremental increases every few years after that. The state has met this goal, mostly because yard waste did take up a lot of space in landfills. The new bill is simply picking up the pace of the diversion rates. Unfortunately the Senator who sponsored the bill was not a good speaker, did not have his facts in order, and then proceeded to add a lot of additional hot air to the room. One of our competitors, who actually pushed for this bill, spoke as a supporter. He did a great job, listing statistics on the yard waste/composting industry in particular and the number of new jobs created in the state from the ban on yard waste, and the importance of the products being produced. A retired waste hauler turned recycling consultant also did a fine job of illustrating how many households now recycle and the market for recycled materials. Then the opponent wanted to talk. Except he said he only wanted to present "Information". The Chair of the committee said no information, you are either for it or you are against it. Wow, something in black or white - how refreshing. Benedict Arnold (I mean being against recycling is like taking on motherhood and apple pie) then proclaimed himself as being against it. Finally - the truth. Benedict struggled with his multiple pages of notes, and I don't think I have ever heard anyone use the word "ummm" so many times in one talk. This guy was all over the place. From stating that the compost facilities only take the yard waste in and then don't do anything with it (gee, that was news to me, I guess I'll have to ask my guys why I am paying for so much fuel each month) to stating that we need to stop shipping all of our trash overseas, I couldn't follow what he was getting at. He made a vague point about the fact that if the yard waste went into landfills then they could tap into the methane gas, and this is really where his lobbying efforts are aimed. One particular trash hauler whom he represents doesn't want to pay the tipping fees for getting rid of its yard waste, but instead wants to resume burying it in the landfill which it owns. Despite the heat in the room, Benedict kept spewing his garbage and then finally, after shuffling through his papers, he found his concluding sentence. The Senators fortunately had no questions for him. I think they were all as perplexed as me. For now, this will sit in committee. "I'm just a bill, yes I'm only a bill and I'm sitting here on Capitol Hill..."
We had tickets to see St. Joan at the Repertory Theater tonight. I was waiting to see how long it was going to take Jim to figure out that we were going to be watching a play instead of the Superbowl plays. It dawned on him this morning. He decided it was no big deal as he could watch the beginning of the game, and perhaps catch the end when we got home if the play didn't run too long. The last two plays we have seen at the Rep have run only 80 minutes with no intermission. As soon as we sat in our seats and opened the program, we heard the ladies behind us stating that they heard the play was pretty good but also long. Okaaaay...so much for seeing the end of the football game. The set for the play was very well done, and I eagerly anticipated the start of the show. It was quite a disappointment. I thought the acting was only adequate, and it definitely drug on and on. I nearly nodded off at one point. So we did something I can't ever remember doing before - we left at intermission. We were not alone in our escape to the parking lot. The theater had not been anywhere near full to begin with, but I imagine it was embarassingly empty for the second act. I hated to do that because having been in plays before I know how much work the actors put into it, but honestly it seemed like such a waste of time to sit there. St. Kim I'm not. We stopped at the grocery store on the way home to pick up some cookies to bake. I have not made use of the convection setting on the oven and wanted to try it out. (That's my story and I'm sticking to it!) While enjoying the fresh from the oven chocolate chip cookies we got to see an exciting ending to the Superbowl game. The evening was salvaged!